Markets are a great way of discovering a city is what I’ve found. Besides visiting monuments and the more famous sights, if you want to really get a flavour of a city, my suggestion would be to visit a market! In Bangalore, I’ve made it a point to visit quite a few of them – Russell, Malleshwaram, Gandhi Bazaar, Chikpet & Avenue Road, Majestic, Madiwala and the absolutely crazy City Market – and try and document some of the sights and sounds. It’s a busy, busy place any time of day. 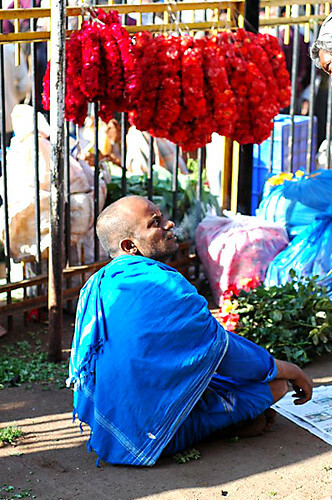 Here’s a flower seller looking out for customers. A bunch of us shutterbugs met at Russel Market last weekend to spend time clicking. It was the first time I was there, and also the first time I was trying to shoot in a marketplace. I had a good time with the camera, and here are some images. Doesn’t the city look pretty at night, all decked in lights and welcoming the festive spirit? Unforunately, I wasn’t in town this Christmas, but here’s a beautiful shot of the streets of Russell Market, Bangalore which wore an especially festive look! Posted in City, Festival, Markets | Comments Off on Stars everywhere!